Weight-loss guru Brad Pilon based his plan “Eat Stop Eat” on the theory of intermittent fasting, which focuses on when you eat rather than the types of foods you include or restrict. According to Pilon, who has a background in the sports supplement industry and nutrition, scientific evidence indicates that brief, regular fasts promote weight loss and retention of muscle better than diets that eliminate certain foods or cut your number of daily calories. As a bonus, intermittent fasting may also lower your risk of chronic diseases. Pilon’s plan involves fasting up to two times a week, and it does not require you to give up any specific food group. This type of regimen does have drawbacks, however, and may not be for everyone. Eat Stop Eat works in a fairly simple way: You fast once or twice a week, aiming for a complete break from food for 24 hours at a time. For example, you might eat normally until 7 p.m. on a Saturday, then fast until 7 p.m. on Sunday, resuming regular eating at that time. If you can’t make it the full 24 hours, Pilon says 20 to 24 hours will also work. For the next couple of days, eat approximately 2,000 calories a day for women and 2,500 for men; never fast on consecutive days. After several normal eating days, you can have another fast and repeat the schedule. Do not exceed two fasts in any one week. By doing even one fast a week, Pilon says you will create a calorie deficit of 10 percent. On your fasting days, you should take in as few calories as possible – Pilon recommends only tea, coffee, plain or sparkling water and diet soda. When you break your fast, you can eat whatever you like, but in moderation, because overeating could undo the benefits of the fast. 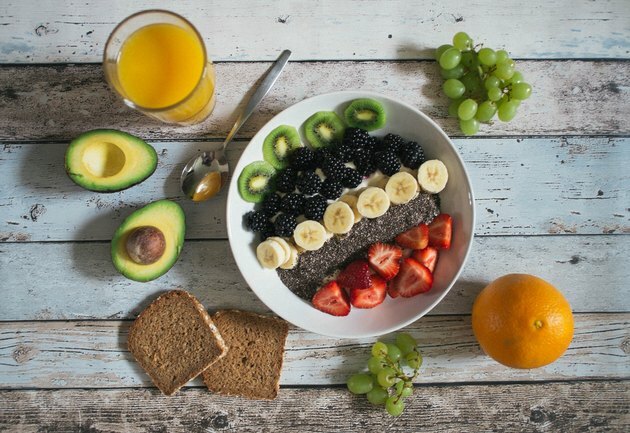 You do not have to avoid any specific foods, such as carbs; in fact, Pilon says a low-carb diet on non-fasting days may negatively affect your energy levels. He does advocate consuming lots of fruits, vegetables and spices. For protein, Pilon recommends 20 to 30 grams of high-quality protein every four to five hours for a total of about 100 grams daily. Some of this can come from protein powder, if necessary. If you find you are gaining weight between fasts, Pilon says to cut back on your food consumption on non-fasting days by 10 percent. When you are on Eat Stop Eat, you engage in resistance or weight training to maintain and build muscle, rather than cardio or other types of exhaustive exercise. You don’t have to exercise on fasting days, however. The Eat Stop Eat Quick Start Guide recommends a consistent training schedule of three to four times per week, with two to four exercises per body part, two to five sets per exercise, and six to 15 reps per set. Scientific research supports intermittent fasting as an effective weight-loss tool. One review of literature, published in Obesity Reviews in 2011, found that up to 12 weeks of intermittent calorie restriction – similar to the Eat Stop Eat plan – was as effective in weight loss as reducing calories by a set amount every day; in addition, it helped dieters retain more lean muscle mass. This type of intermittent fasting may produce other health benefits, too. A review published in The American Journal of Clinical Nutrition in 2007 discovered that fasting on alternate days led to lower risk of chronic disease in animals, although more studies on humans are needed. Pilon cites reduced inflammation and cellular “cleansing” as other possible benefits. Finally, Eat Stop Eat may be less confusing and more straightforward than diets in which you have to limit an entire food group, like fat or carbs. Having to fast every week may not fit your lifestyle. Richard Bloomer, chair of health sport sciences at the University of Memphis in Tennessee, told the journal CMAJ in 2013, “Most people aren’t going to be able to do it.” Pilon admitted to the same reporter that Eat Stop Eat is best done privately because it interferes with regular social interactions, like meals with family or friends. The diet may cause headaches and crankiness in some people, and is not a viable choice for diabetics, pregnant women or those with a history of eating disorders like bingeing. The plan permits artificially sweetened drinks, which may actually make you crave sweets or choose unhealthy foods because you have “saved” calories. Finally, Eat Stop Eat doesn’t make any specific meal-plan recommendations for non-fasting days, leaving you to demonstrate enormous self-control and judge for yourself what to eat – an area in which many people who struggle with their weight need guidance. Obesity Reviews: Intermittent Versus Daily Calorie Restriction: Which Diet Regimen Is More Effective for Weight Loss?